All-white sneakers probably weren't the best idea. After the biggest year of his professional career, Von Miller was a featured guest at tonight's Nickelodeon Kids' Choice Awards taping in California. While he's arguably the NFL's most brilliant defender, Miller probably didn't make the smartest choice when picking out his sneakers for the event. The reigning Super Bowl MVP laced up all-white adidas Ultra Boosts, despite the fact that Nickelodeon is famous for "sliming" its celebrity presenters. 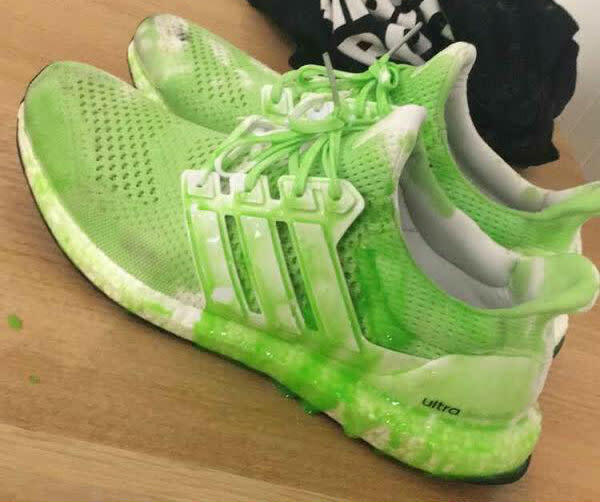 Sure enough, during a stunt on the show, Miller's Ultra Boosts met their bright green fate. Miller shared a photo of his slime-covered runners on his Snapchat following the show, and honestly, they're kinda cool. Maybe adidas just stumbled across the next great colorway.